A nationalist alliance has won a majority in regional elections on the French island of Corsica, giving extra muscle to demands for more autonomy. The governing For Corsica coalition (Pè a Corsica) won 56.5% of votes in the second round of polling on Sunday. The nationalists say they want more autonomy, not full independence. For decades militants waged a violent "national liberation" campaign on the island, which has 330,000 inhabitants, but in 2014 they announced a ceasefire. There has been much speculation that the Catalan independence drive could inspire separatist movements in Corsica and elsewhere in Europe. Corsican nationalist leader Gilles Simeoni said he had told the French government that he expected "a true dialogue, so that the Corsica question is settled politically in a peaceful and long-lasting manner". His alliance wants an amnesty for Corsicans jailed for pro-independence violence, equal status with French for the Corsican language on the island and a "Corsican resident" status to dissuade French investors from buying up local properties. Are Corsica's days of militants and the mafia over? The party of President Emmanuel Macron, La République En Marche, got 12.7% of the vote in Corsica. 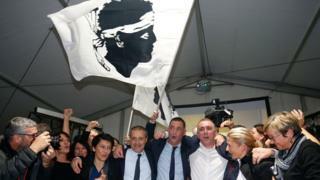 The triumph of For Corsica means the nationalists will have a clear majority in the island's 63-seat parliament. Turnout was 52.6%, lower than in the 2015 regional election. Are Corsica's militants and mafia a thing of the past?